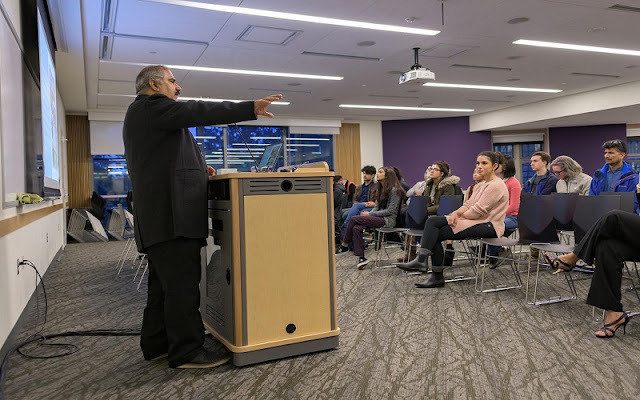 The event began after brief introductions to introduce speakers Sana Choudhary, a senior student and president of the Pakistan Students' Association, and Asad Faizi, president and founder of the Pakistani-American Friendship Forum. Faizi started a lecture and found that there is relatively little knowledge about Pakistan and its people. Essential to his assessment and discussion of the identity of the Panel was to give the public a working knowledge of the broad history and the far-reaching culture of one of the oldest civilizations that existed 30,000 years ago. Throughout this story, though there have been many different imperial changes, according to Faizi, the Pakistani people wanted to be mostly independent. During the third century, the Omayyad dynasty was "one of the links that connect the Middle East," Faizi said. This kingdom was crucial to the creation of Muslim identity in the Indian subcontinent. The effect of the Omayyad dynasty was so great that, 500 years later, the effects of that Muslim introduction were still evident, even though the Muslim influence was the minority. Religious affiliation aligned the Pakistani ruling class with the Central Asian Turks, forming a link and, to a greater extent, a way to situate identity. "We identify with the Turks and the Central Asians," Faizi said. "After 300 years, Babur, a descendant of Genghis Khan, founded the Mughal Empire, which ruled the Indian subcontinent for 350 years. Again he was from Persia, Afghanistan ... a lot of deep connections. At the present time, after the end of the British colonization of the Indian subcontinent after the Second World War, Pakistan was able to govern itself. A 40-year political struggle finally culminated in modern Pakistan, which declared its independence in 1946. As a result, many different ethnic groups, identities and cultures were present in Pakistan today. Faizi explained that this is crucial for understanding Pakistani identity due to a major cultural merger. Instead of an identity, there are many. After this discussion, the panel answered questions from the audience. The first question was directed to Faizi and Choudhary for their thoughts on the state of affairs in Pakistan. "Although the government has been democratically elected, democracy has not always prevailed in Pakistan," said Faizi. "In the last 15 years, however, the third government has been democratically elected. Something happened in the past. Democracy brings corruption, mismanagement and nepotism - so I think Pakistan has taken a corrective course. " Choudhary attributed this correctional course and political progressivism to the entire youth of the Pakistani people. "I know that the majority of the population is between 18 and 30 years old," Choudhary said. "I think that's a reason for the new government in Pakistan because it's more progressive." The discussion shifted internally to issues of Pakistani identity and affiliation with America. in particular, how to reconcile two different backgrounds in a Pakistani-American perspective. Her first experience in America, according to Choudhary, was that people asked her if she was an Indian, which made her question her identity and if it was important. "I was born in Pakistan and moved here at about two and a half years, so I grew up here," said Choudhary. "Most people did not know Pakistan. People asked me if I was Indian and I would say, "No, I'm Pakistani." And when I grew up, I came up with the idea, is not that important? Is not that important? " When she first came to UW, Choudhary had not previously spoken Urdu, the Pakistani language, outside the home. When she attended the meetings of the Pakistani Students Association, she realized that the Pakistani is her own unique identity. At the same time, Choudhary spoke about the importance of identifying as South Asian or the Middle East. She was more attracted to the Middle East because she had a strong connection to her Muslim identity, which in her opinion does not include Asian identity. "The strongest thing I feel most about the Middle East's identity is due to Muslim identity," Choudhary said. Finally, the discussion was concluded with art and national identity. Choudhary talked about her interest in Pakistani dramas and cited that they appealed to the masses more than Indian dramas because they represented real people. Faizi repeated similar remarks and related how he saw a revival of Pakistani cinema. Both were optimistic about the future of Pakistan in the modern landscape and referred to their interest in culture and the rich history of Pakistan. The rich culture shown here is diverse and demonstrates the breadth and depth of Pakistani identity. It is a symbol that there is no true identity but a complex and differentiated narrative.